Shazam announced a major milestone Thursday: The company’s apps have been used more than ten billion times to identify songs and other types of media. The ten billionth tag supposedly came from a user in East Brunswick, New Jersey, who asked Shazam to identify Lady Gaga’s Applause. 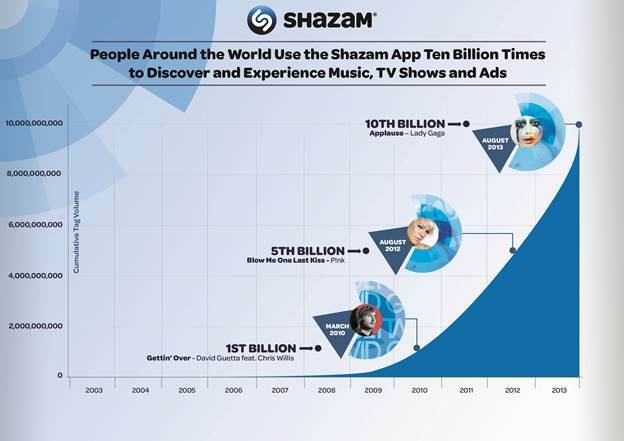 Shazam also said that it helps to generate $300 million in digital music sales every year, thanks to users who identify a track and then click through to a digital retailer to buy it. This means that the company now initiates 10 percent of all digital music sales. It’s going to be interesting to watch this number and see how it changes as people move towards digital subscriptions. Shazam recently added a direct link to Rdio to its mobile apps.